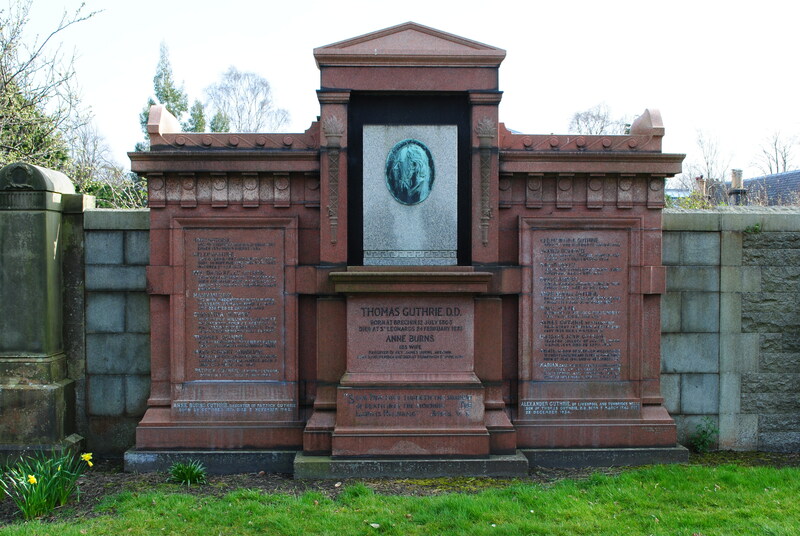 Thomas Guthrie is known for his eloquence as a preacher, his involvement in the Free Church of Scotland, and his philanthropy. He was born in Brechin on 12 July 1803, the son of David Guthrie, merchant, banker and Provost of Brechin. In 1814, aged 12, he attended Edinburgh University. He hoped to become a Minister in the Church of Scotland, but he was not successful in this until 1830, when he became Minister of Arbilot, near Arbroath. In the meantime, as well as Theology, he studied surgery and anatomy. He moved to Edinburgh in 1837, and was shocked by the poverty he saw in the city. This prompted him to set up his famous Ragged Schools, where destitute children were given education, regular meals, clothes, ‘industrial training’, and Christian instruction. He was also very active in the Temperance movement. He joined the Free Church after the Disruption of 1843, and was active in raising funds for the new Church. He became Moderator in 1862, and retired in 1865. In 1830 he married Anne Burns (1810-1899), the daughter of Rev James Burns of Brechin. They had 11 children born between 1831 and 1853. He died in 1873, at the age of 69. His widow survived him by some 16 years, dying in 1899 at the age of 88. His eldest son, David Kelly Guthrie (1831-1896), was also a Minister. He married Hannah Kirk (1838-1900) and they had a son, also David Kelly, who died in July 1874 aged 5 months. His eldest daughter Christina (1833-1895) married the Rev. William Welsh, Minister of the Free Church at Broughton in the Borders. Two of his sons, James (1835-1920) and Charles John (1849-1920) married sisters, whose father, Rev. James Chalmers Burns, was the brother of their mother Anne. James, who was a banker in Brechin married Christine Chalmers Burns. Charles, who became the judge Lord Charles John Guthrie married Anne Jemima Guthrie Burns. Patrick Guthrie (1836-1925) was a banker in Edinburgh. He married Mary Stoddart Anderson (1840-1902) and four of their children are commemorated along with their parents: James Dymock Guthrie (1865-1866), Mary Susan Guthrie (1874-1914), Anne Burns Guthrie (1876-1942) and David Robert Guthrie (1883-1888). Clementina (1839-1908) appears to have remained unmarried. Anne Guthrie (1841-1922) married Stephen Williamson, the founder of the Liverpool shipping firm Balfour, Williamson Ltd, and a Liberal MP. The company traded with South America, and the connection may explain how the Rev Thomas’s son, also Thomas Guthrie (1843-1900) became a landowner in Argentina and died of consumption in Buenos Aires. Alexander Guthrie (1846-1934) was a merchant in Liverpool. He married Marian Fairbairn (1852-1934). Helen Guthrie (1851-1883) married David Gray from Glasgow. They had a daughter Anne Burns Guthrie Gray (1874-1914). The youngest child, John lived only 20 months, and died on 9th August 1855.